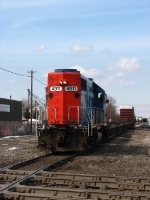 Description: A pair of GT GP38-2's passing in front of the Durand station. Description: CN 242 heads south after switching Durand seen at Pitt just south of Durand. Description: L500 winds around the High Wye. Description: L500 Shoving Cars Into Durand Yard. Description: L500 has finished his work and runs around to head back to Flint. Description: Father and son watch as GTW 4911 backs past the depot. Description: GTW 4911 winds around the High Wye heading back to Flint. Description: L500 running with no cars heads back to Flint. 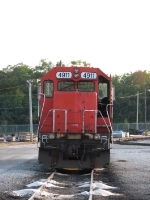 Description: CN 101 shoves into the yard. Description: a CN SD60F comes out of the yard as 101 prepares t omake its doubles. Description: Another shot of the foursome as they head south on the Holly Sub. Description: Four GTWs are on the point of Train 513 (which was over 10,000 feet). Amazing!